David Fickling Books, 9780385751872, 194pp. 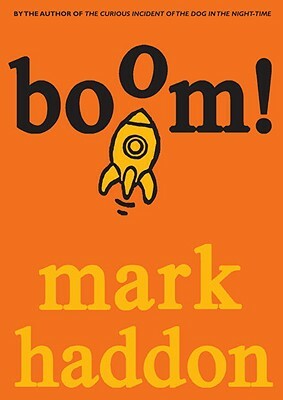 An explosive, highly charged, and hilarious middle-grade adventure from Mark Haddon, acclaimed author of The Curious Incident of the Dog in the Night-time. From the moment that Jim and his best friend, Charlie, bug the staff room and overhear two of their teachers speaking to each other in a secret language, they know there's an adventure on its way. But what does "spudvetch" actually mean, and why do Mr. Kidd's eyes flicker with fluorescent blue light when Charlie says it to him? Perhaps Kidd and Pearce are bank robbers talking in code. Perhaps they're spies. Perhaps they are aliens. Whatever it is, Jimbo and Charlie are determined to find out. There really is an adventure on its way. A nuclear-powered, one-hundred-ton adventure with reclining seats and a buffet car. And as it gathers speed and begins to spin out of control, it can only end one way . . . with a BOOM! MARK HADDON is an author, illustrator, and screenwriter who has written 15 books for children and won two BAFTAs. His bestselling novel, "The Curious Incident of the Dog in the Night-time" was published simultaneously by Jonathan Cape and David Fickling in 2003 in the U.K. It won 17 literary prizes, including the Whitbread Award, and is an international bestseller. Mark Haddon lives in Oxford, England.